Now is the time perfect time of the year to start using the Threshold Improvement Notification feature in TrainingPeaks. As you move from base to build and as the first race of the season looms closer, your threshold will likely change more quickly. Using this feature will keep you up to date and training in the right zones. You also take the guesswork out of deciding when to change your threshold and the corresponding training zones. Simple to set up and use, the Threshold Improvement Notification feature is one that can be a valuable tool for any athlete. Training for any event requires an athlete to work at a variety of intensities, known as training zones to most. In order to define your training zones however, it’s most important to first know your threshold. 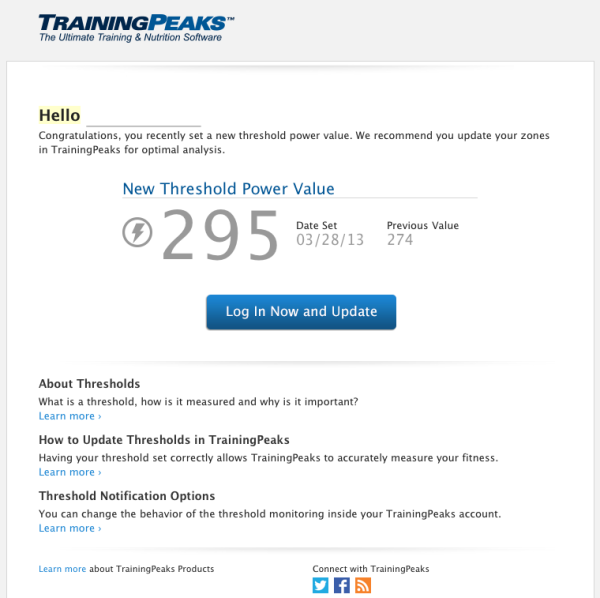 It’s so important in fact, that a few months ago TrainingPeaks devised a new feature called Threshold Improvement Notifications. Let’s explore why would you want to keep updated with your most current threshold value. To begin, the exact meaning of threshold is hard to define and is often debated. For our sake, and the sake of simplicity, we define it as the level of effort you can steadily hold for one hour, as measured by heart rate, power or pace. This is true for running, cycling, swimming or any endurance exercise. Knowing your threshold value is important for two key reasons. First, performing work at this level, monitored by heart rate, pace or power, is a key aspect to any training plan. Working at your threshold will help you build many aerobic systems at the same time, meaning you get a lot of bang for your buck. Second, your threshold value determines your other training zones, such as recovery or endurance. Training in the proper zone, again through heart rate, pace or power, is crucial to ensure you are working at the appropriate level in order to get desired results. All zones are calculated using your threshold value, so having it set right is critical to getting all of your training zones correct. It is important to note that when you start training, you will need to do a threshold test to determine your threshold for the first time. This can be done in a lab or in the field. An example of field testing is Joe Friel’s recommendation that an athlete run hard for 30 minutes alone, then use the average pace or heart rate for the last 20 minutes as your lactate threshold. Such methods of “field testing” may not be as accurate as lab testing but will still provide a sound estimation to base training zones off of, as well as measure fitness improvements over the season. (See Joe Friel’s Quick Guide to Field Testing and Setting Zones). Once you’ve determined your starting threshold, using the Threshold Improvement Notifications within TrainingPeaks will keep this important metric updated. The tricky part about threshold is that as you become more fit, it will change. As you get more fit, your threshold will rise and your HR/Pace/Power zones will need to be changed to reflect your new fitness. This is especially true this time of year as you move from your base period to your build phase. Adding more intensity will lead to gains in fitness, and the purpose of the Threshold Improvement Notification is to help you keep track of your threshold and when you should change it. Power Threshold: We suggest a threshold increase if NP (Normalized Power) Peak 60 Min OR 95% of your Average Peak 20 Min Power (whichever is higher) is greater than the currently set threshold. Pace Threshold (Run Only): We suggest a threshold if your Peak 45 Min Average Pace is faster than the currently set threshold. When any of these three conditions are met during a workout, field test (which should still be done every six to eight weeks) or race, TrainingPeaks will send you an email notifying you of your new suggested threshold. So say you’re out on your usual run test loop and hold over 95% of your previous best Peak 20 Minute Heart Rate. When you download the run you will receive an email notifying you of your new threshold value. If you’ve chosen to have TrainingPeaks automatically update your threshold for you, it will be done at the same time (unless you have adjusted any of our zones manually). No longer do you have to spend time combing the data to see if your threshold should be changed. A quick check of your email inbox will tell you what you need to know. If you choose not to have your threshold and zones automatically updated, you can view the new suggested threshold then decide if you want to manually update your threshold value within your Account Settings. This means that if you have a great workout and push yourself to a new level you will instantly see your progress in the form of the notification. Using our formulas to determine your new threshold takes the guesswork out of the equation and gives you numbers you can trust. If you have a coach, your coach will also see these notifications. Keep in mind that for coached athletes, the coach controls if their athlete sees the notification or not. The Threshold Improvement Notification feature is also not device dependent. It will work with any heart rate monitor, GPS watch or power meter. So whether you are a runner with a heart rate monitor, a cyclist with a power meter or a triathlete with a GPS watch you will be covered. Keeping your threshold up to date is also vital for any athlete that monitors their overall progress with the Performance Management Chart. The PMC relies on your daily Training Stress Score, which is calculated using your threshold values. In order to get the most accurate picture of your training, keeping your threshold up to date is key. Now that you know how important your threshold value is, you can see why it is crucial to continually monitor it, and why Threshold Improvement Notifications is such a great feature. The Threshold Improvement Notification option is not a default for every athlete. Athletes can choose to turn on these notifications in their Account Settings by clicking the Zones tab on the left. In the corresponding window, choose the Threshold Notifications tab in the far right. Once you turn the Notification on, you have the option of having TrainingPeaks automatically change your threshold for you or just receiving the notification in which case you will need to change your threshold manually. You can also choose to have your threshold change automatically without receiving the notification. Athletes that work with a coach should know that their coach will have some control of their Threshold Improvement Notification option. A coach has the same options as an athlete when it comes to receiving the notifications and any changes automatically made. Premium coached athletes who pay for their own accounts have access to this option along with their coach. A Basic client or Premium client will get notifications or not depending on preferences selected by the coach.